Twin Cities Daily Photo: Look What I Found! I was thinking of making this a guessing game for the locals. But I've decided against it, though I am curious if anyone has visited this location. I am standing under Highway 61, [click here for an aerial shot] in St Paul. 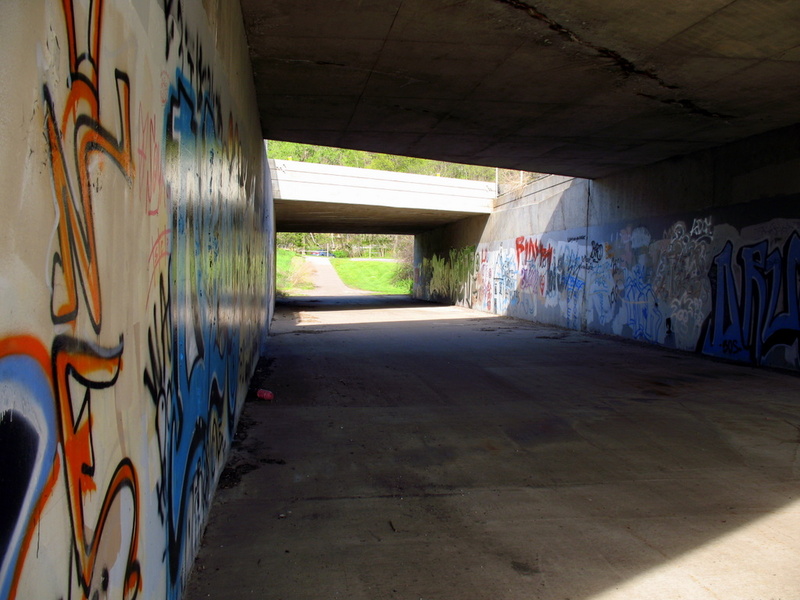 I stopped at the roadside park, which I believe leads into Battle Creek Park, and was surprised to find this tunnel filled with spray paintings of all sorts. these type tunnels fascinate me, because of the grafitti. Recently my apartment complex got some grafitti, but nowhere near as cool looking as some of these. Now if I had to scrub it off I wouldn't think it was cool at all. I took quite a few photos in here. It was so unexpected to see this with so much graffiti.